MomCo has partnered with The Good Dinosaur for a giveaway that’s tailor made for moms and kids. The MomCo The Good Dinosaur giveaway is celebrating the upcoming arrival of The Good Dinosaur in theaters November 25th in a big way with this great giveaway. MomCo is a mobile app that helps connect moms in communities based on proximity and common interests and experiences for all the friendship and support they need. With the MomCo app, moms can share pictures, ask questions, and get the support they need quickly and easily. They can even arrange playdates, keep up with events in the community, and save money through exclusive deals. It’s not as easy to make friends as an adult or parent, so let MomCo lend a hand. Maybe you can meet some people on MomCo to form a group to go see The Good Dinosaur together! Make it a big family and friends movie night. The Good Dinosaur” asks the question: What if the asteroid that forever changed life on Earth missed the planet completely and giant dinosaurs never became extinct? Pixar Animation Studios takes you on an epic journey into the world of dinosaurs where an Apatosaurus named Arlo (voice of Raymond Ochoa) makes an unlikely human friend. While traveling through a harsh and mysterious landscape, Arlo learns the power of confronting his fears and discovers what he is truly capable of. Directed by Peter Sohn and produced by Denise Ream (“Cars 2”), Disney•Pixar’s “The Good Dinosaur” opens in theaters on Nov. 25, 2015. For more information, check out the good-dinosaur, like us on Facebook, and follow us on Twitter, and Instagram. MomCo is partnering with The Good Dinosaur for a good giveaway. See what I did there? 😉 This giveaway is all about spending time with kids and friends. In addition to the 3 phase giveaway, moms can download printables and activities from the MomCo app and website for some great The Good Dinosaur fun. There will be a different giveaway in each phase, and they’re all a ton of fun. 1st Giveaway – 11/4/15 through 11/13/15. Celebrate MomCo and their partnership with Disney/Pixar. 2nd Giveaway – 11/14/15 through 11/24/15. Have a playdate to celebrate the upcoming release of The Good Dinosaur. 3rd Giveaway – 11/25/15-12/31/15. Have a playdate to celebrate the release and Opening Weekend of The Good Dinosaur. There are a ton of fun prizes to win with the MomCo The Good Dinosaur giveaway. You can win everything from a gift certificate to The Disney Store to loads of The Good Dinosaur swag. For full rules and information, check the MomCo giveaway page. So get in on that action. On its own, Momco is a great app for moms to find other like-minded mommies for everything from moral support to playdates for the kids. 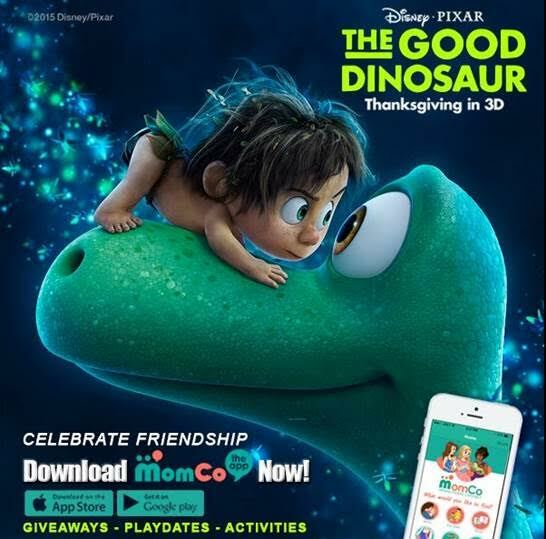 When you add in their awesome The Good Dinosaur giveaway, there’s really no reason not to get the MomCo app. So download it, use it, and maybe win some cool swag. Thanks so much! We can’t wait to see all of the pictures from everyone’s The Good Dinosaur play dates! I cannot wait to see this movie! it looks like such a great family film.